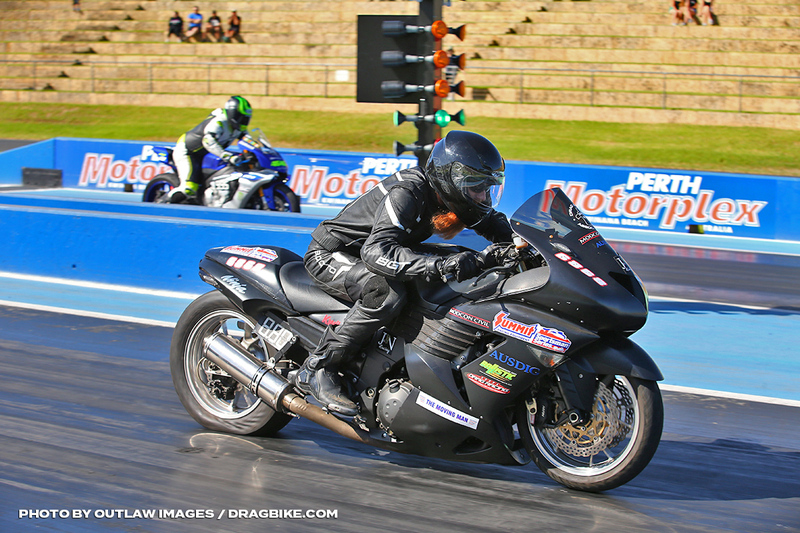 The final round of the 2018/2019 Summit Racing Equipment Sportsman Series at the Perth Motorplex brought to a close an intense season of racing at the weekend (April 6/7). At the end of two big days of on-track action, both season champions and event winners were celebrated with plenty of ANDRA Christmas Tree Trophies being handed out along with the prestigious John Storm Memorial Trophy. For a full listing of championship winners and runners-up from the weekend as well as event winners and runners-up, please click here. For a run down of how each of the brackets unfolded over the weekend, please read on. Event runner-up: Bruce ‘Budgie’ Jones. In Modified Bike it was Chris Moore who took out the event win over Bruce ‘Budgie’ Jones, after enjoying a bye run in the semi-finals and earlier victories over Chris Morgan (quarter-final), Zoe Nieuwhof and Christopher Fryer. Jones suffered a heart-braking failure on the startline in the final after having earlier emerged victorious from battles against Luke Seaton (semi), Tom Gartrell, Chris Allen and championship runner-up (and 2018 title winner) Bryan Finn. The bracket’s winner of the Top Qualifiers Medallion, thanks to TileCo-TheShowerPeople and KC Tools, Trent Anthony, enjoyed a bye to the second round where he was defeated by Seaton. Championship getter Hamilton-Moderate made it through to the third round before being eliminated from the event proceedings, however you still couldn’t wipe the smile off his face as he had earlier been confirmed as the Summit Racing Equipment Sportsman Series Modified Bike Champion. “At the last ANDRA Grand Final my wife said to me, ‘you have to win me one of those,’ so it was good to be able to back that up. 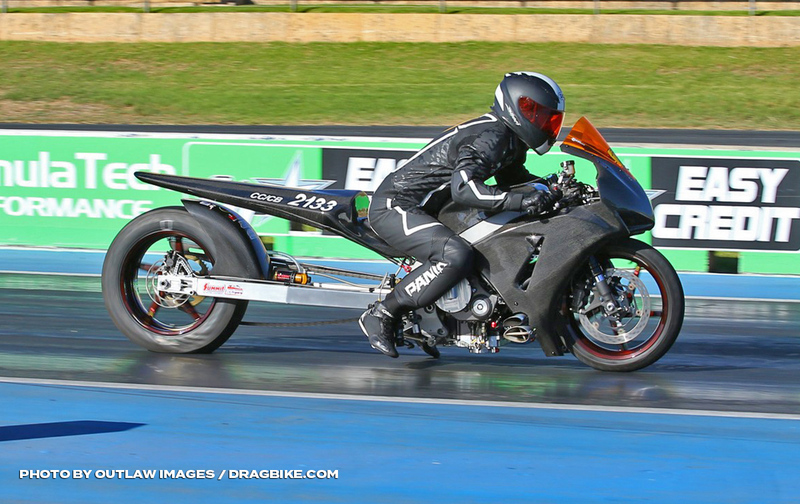 It was a troubled run to the top for Rob Cassar, who took out his first Summit Racing Equipment Sportsman Series Competition Bike championship on a tie break with runner-up David Willis.“We broke the motor in the pits before the first round,” explained Cassar. “We warmed up in the pits and broke the engine, we had David Willis in the first round and I had an hour to put an engine in. We had never run that motor before and we said, ah well, let’s send it! “In that run it sort of creeped through the water, and I thought that was going to be it, championship over. In the next round I said I am not doing a burnout, and it surprised me! In the next pass I thought I wouldn’t do the burnout again and we went 7.43s at 170-something mile per hour and I thought, wow! Brett Ghedina took out the event victory following his top qualifying performance the day before, and also reset a national record in the process (further details to be released later this week). 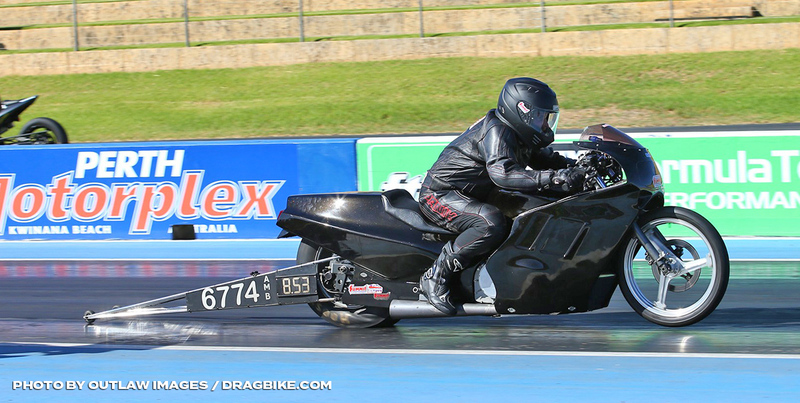 For full results from the ANDRA Grand Finals, please click here. 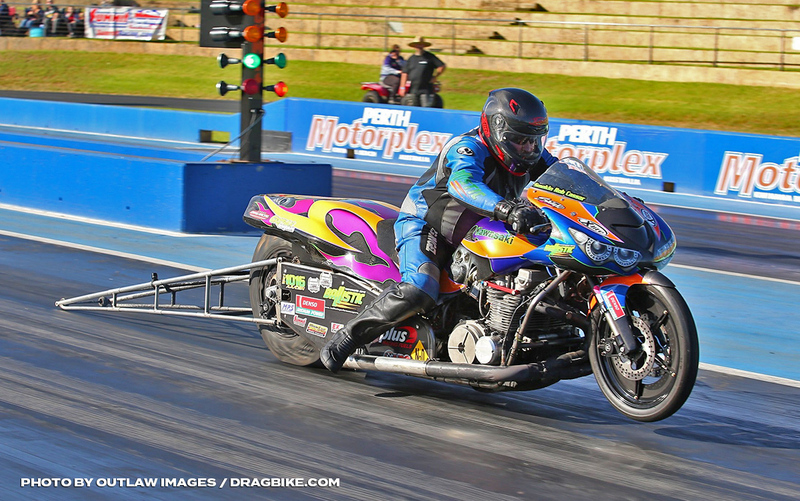 Just one day of racing is all that remains for the 18/19 Summit Racing Equipment Sportsman Series, following the conclusion of day one of the ANDRA Grand Finals event at the Perth Motorplex this evening. Come Sunday evening, nine well-deserving competitors will join previously announced title winners Adrian McGrotty (Super Gas) and Jake Berias (Summit Racing Equipment Junior Dragster) in being celebrated as ANDRA Champions following an intensely competitive season of racing. Following today’s on-track action, Kyle Putland (Competition), Todd Stacy (Sunoco 260GT Plus Top Qualifier for Super Stock), Brett Ghedina (Competition Bike) and Jack Bowden (Supercharged Outlaws) have secured the Top Qualifiers Medallions – thanks to TileCo-TheShowerPeople and KC Tools – for their respective brackets. While a number of racers will have their eyes on a championship tomorrow, for Putland it is all about chasing a national record, and maybe an event win while he is at it. 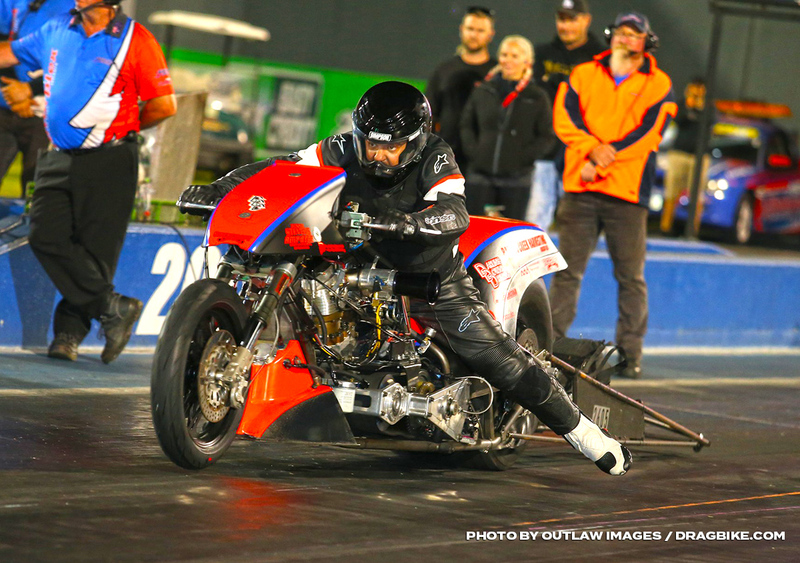 On his way to taking out the Competition Bike Top Qualifier Medallion thanks to TileCo-TheShowerPeople and KC Tools this evening, Ghedina ran under the current CC/CB national record of 7.446s with his top qualifying 7.192 second pass. Meanwhile the number two qualifier, Justin Townson, ran under the current CC/CBN record (7.500s) with his 7.472s effort. “Today went spectacularly well – we thought it was going to go fast, but not that fast! Sometimes you win and sometimes you lose, so that was a very good win!” said Kalamunda (WA) racer Ghedina. “Tomorrow it will most likely come down to the person that makes the least mistakes will win, it is often the case for our level of racing! If you don’t make a mistake you will be pretty well set, you just have to make sure you make less mistakes than the person you are racing. “We are feeling reasonably confident having the top qualifying spot, but we are still doing a lot of testing with this motorcycle so I haven’t really been focusing on my start line reactions. So even though I top qualified by a massive margin, I kind of give that advantage away on the tree at the moment. We will just see how it goes tomorrow and keep turning it up to make it go faster! The Australian National Drag Racing Association Ltd, or ANDRA for short, is the drag racing sanctioning body of Australia. The organization was created in 1973 from a more drag racing oriented faction of the Australian Hot Rod Federation. Today ANDRA sanctions races throughout Australia and throughout the year at all levels, from Top Fuel to Junior Dragster, on everything from temporary regional tracks to international standard facilities in capital cities. ANDRA and its members make drag racing a family friendly, safe sport. So come along as a spectator or bring your street car to an “off street” event and enjoy the excitement that is Australian drag racing.